Bilkent University has again been named as Turkey’s highest-ranked university the latest Quacquarelli Symonds Graduate Employability Rankings for 2018. 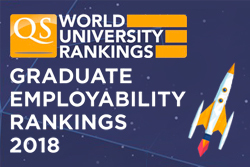 The Graduate Employability Rankings compare the employability outcomes of higher education institutions around the world, in an attempt to evaluate the institutions’ reputations among employers and the attractiveness of their recent graduates in the job market. Indicators used in these rankings fall into five categories: employer reputation (30%); partnerships with employers (25%); alumni outcomes (25%); employer –student connections (10%); and graduate employment rate (10%). Among the universities evaluated, Bilkent ranked in the 251-300 band overall. Boğaziçi, İTÜ, İstanbul, Koç, METU and Sabancı universities ranked in the 301-500 band.